"Knowing your brain makes life so much easier." IFC Films has debuted the first official trailer for an indie comedy film titled The Female Brain, which is the feature directorial debut of popular comedian/actress Whitney Cummings. Cummings also stars in the film as a "no-nonsense neuroscientist", researching the biochemistry of the female brain. The film attempts to explain how and why our brains work when it comes to attraction and relationships, in a quirky, comedic way. The full ensemble cast includes Cecily Strong, Blake Griffin, Sofia Vergara, Deon Cole, Lucy Punch, James Marsden, Toby Kebbell, as well as Beanie Feldstein (from Lady Bird and Neighbors 2). This trailer doesn't have much impressive footage in it, with barely an appearance by Toby Kebbell in one shot. I'm not too sure this will be any good. See below. What makes a woman swipe right for Mr. Wrong and left for Mr. Right? This simultaneously entertaining and enlightening comedy is a fresh, witty, and all-too-relatable look at the real science behind our (often regrettable) romantic impulses. Whitney Cummings stars as no-nonsense neuroscientist Julia, whose research into the biochemistry of the female brain is illustrated by three couples: newlyweds Zoe (Cecily Strong) and Greg (Blake Griffin), whose career troubles seep into their relationship; Lisa (Sofia Vergara) and Steven (Deon Cole), who are looking to spice up their stuck-in-a-rut marriage; and Lexi (Lucy Punch) who can't help trying to change her boyfriend Adam (James Marsden). Meanwhile, straight-laced Julia's own synapses start to fire when a handsome new subject (Toby Kebbell) joins her study. The Female Brain is directed by comedian Whitney Cummings, making her feature directorial debut. The script is written by Neal Brennan, Louann Brizendine, and Whitney Cummings. This first premiered at last year's LA Film Festival. 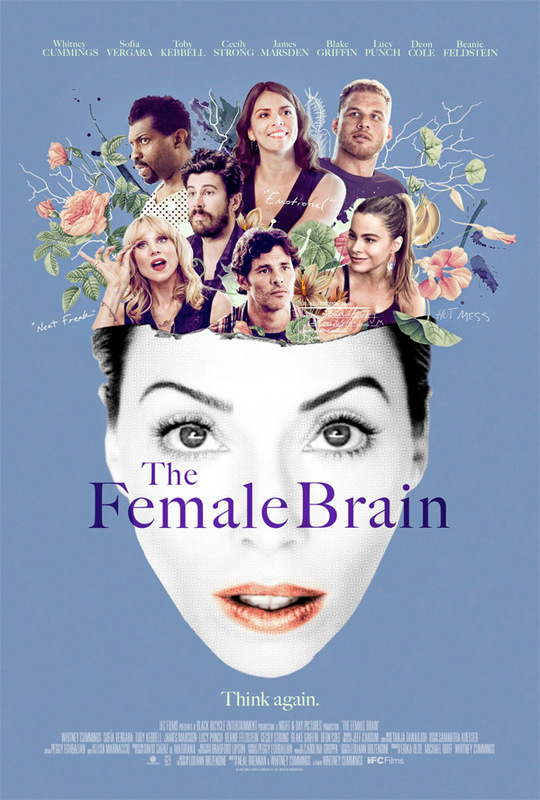 IFC will release The Female Brain in select theaters + on VOD starting February 9th this winter.